I've got another Christmas project for you on this fourth day of My Creative Time's 5 Days of Christmas! I love giving out gift cards for the holidays, and MCT products can make the packaging so cute! For this one, I used one of the Stitched Postage Frame Dies to make a little base that I could attach a pocket to, which I made with the Stitched Gift Card Pocket Die. I then made a coffee cup with the cutest dies from We're Better Together! For my sentiment, I found the perfect one in More Gift Card Sentiments. Since it is one long stamp, I masked off one part at a time for it to fit onto the rectangle that I had die cut with one of the MORE Stitched Rectangular Dies. Of course, I needed a cute envelope to put this gift card into, and the Scallop Stitched Envelop Die makes one the perfect size for this project! Once I tuck it inside, I'll tie some twine around the brads to secure it. OMG Miss Katie...Your gift card is so sweet and beautiful...love the papers you used as it (to me) gives it that vintage look *which is a fav of mine*!! I too love how you decorated your Kuppa Kuppa...you so did a Super Outstanding Creative job!! YOU so ROCK!! Beautiful gift card holder! Your cup is so pretty and love the matching envelope! Great for those coffee lovers! I love the cute coffee cup!! Such a beautiful gift card holder! Awesome job! That's a really cute gift card holder. Thanks for all your inspiration this week!! Simply wonderful! LOVE your gift card holder with that awesome envie! Great way to spread holiday cheer! Love the little pieces on the backgroud. Perfect patterned papers for a fun Christmas gift card holder. Very cute with the coffee cup. I like the postage die and choice of papers. An incredibly sophisticated way to dress up a gift card; the coffee cup, the pretty floral sleeve, the plaid and, of course, the pretty envelope, make for a lovely ensemble! So imaginative! You have a knack for picking the right papers to go together! Beautiful job on your gift card holder. Love the postage stamp die cut! Cute idea!! Love the little coffee cup! Awesome gift card presentation! 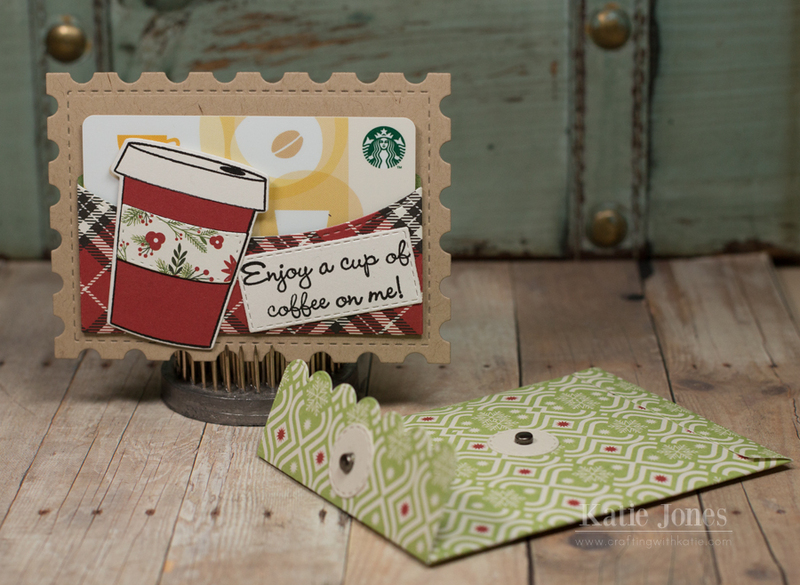 Love the coffee cup and the dies you used for the gift card holder and envelope! Great stamps and dies! Pretty paper choices too! Loving your envelope, looking good with that coffee cup! Perfect holder for a coffee (or tea!) gift card. Love your idea. The cup is so cute and what a pretty envelope. How beautiful! Love the color combinations you used!